Didn't Django die saving Wanda from Chthon? Sort of. 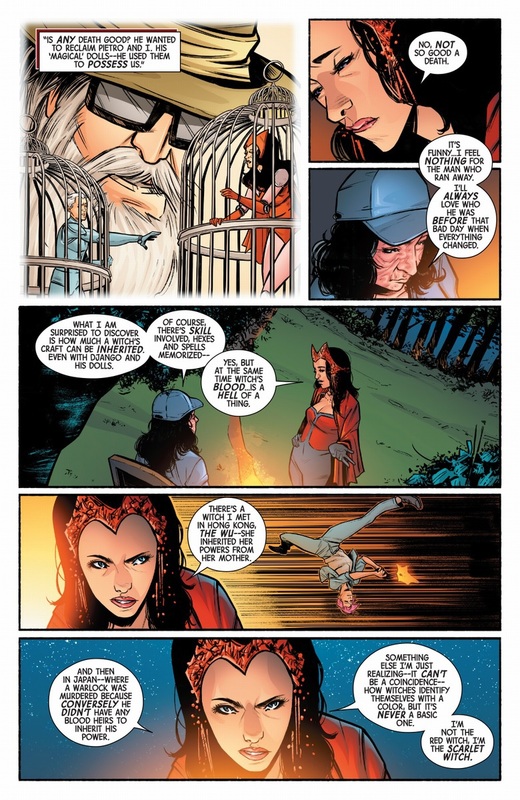 When Chthon was possessing Wanda and gloating to the Avengers, Django was lamenting over the doll he'd trapped her soul in and she woke up in it and spoke to him. 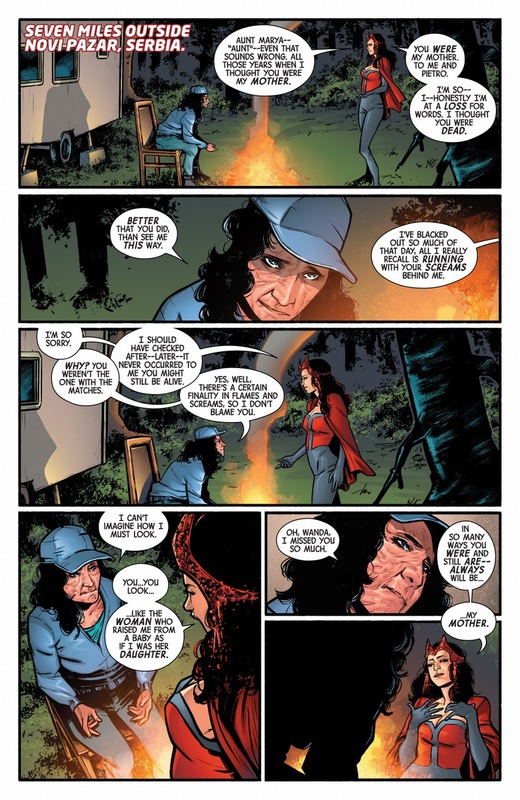 That surprise gave him his lethal heart attack, and then the Avengers used the doll to swap Wanda's soul with Chthon and bury him under Wundagore Mountain (which Wanda made explode like a volcano). But it was Django trapping Wanda and Pietro's souls that brought them to Transia and within Chthon's reach in the first place. 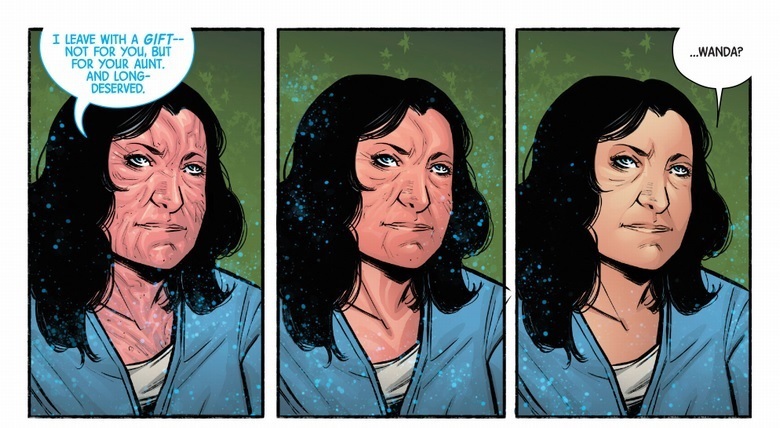 personal pet peeve, the whole "i feel what was before was to prepare me for this" thing writers use to connect previous stories usually feels forced to me. Like the writer feels the need to have everything connected when it doesn't need to. Sometimes trouble happens that is not connected to anything else. 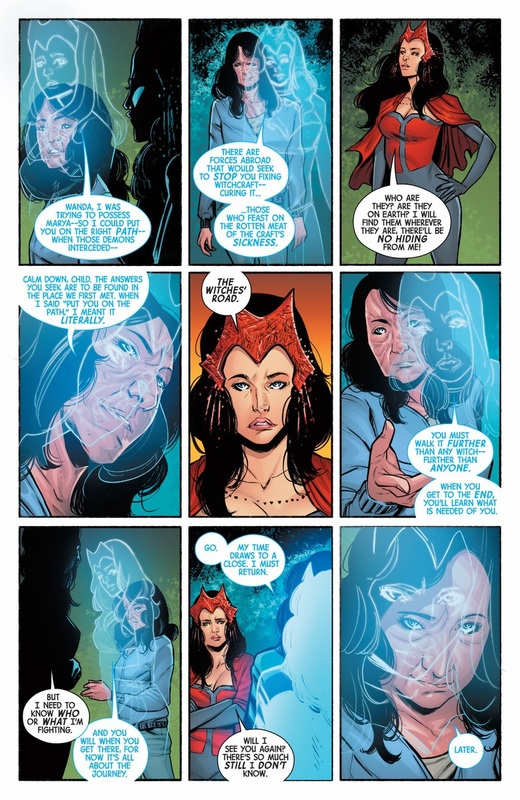 Wait, so Wanda inherited her witchy powers from her mother Natalya, but Natalya inherited them from her father? 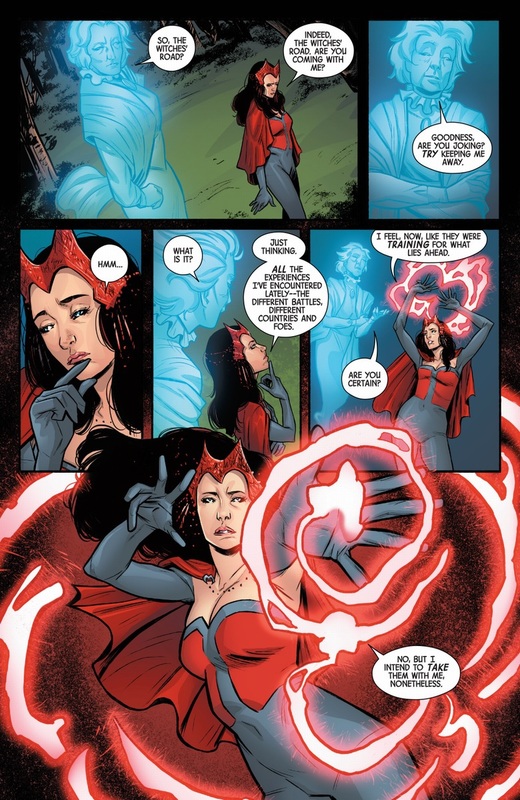 This series had been showing that Wanda’s power is not Chaos Magic, but is “Witchcraft,” magic “linked to the energy of the Earth and Womankind,” and Robinson was “really making a point of stressing that there’s a female energy that connects with a certain kind of magic” and that “there are literally areas of dimensions that she can go to that Doctor Strange wouldn’t be able to go to, because he’s a man“ [source]. So how could she inherit her "witchcraft" from her father? Well it could be the same magic, but channelled through a different filter depending on the gender of the wielder, so her grandfather's magic would have been a different application, or he might have been the odd one out, being a man inheriting "female" magic. To use, yet again, the Discworld as a point of reference, the difference put forward is that whislt both wizards and witches use magic, they used it in vastly different ways. To cause an avalanche, a wizard would shake the mountain, whilst a witch would find the spot where one additional snowflake would start the cascade. Emerald Warlock and Aoi Master (which is still a terrible name and Robinson should just stop) were both male so that whole "witchcraft is specifically female magic" thing hasn't been very consistent. But Robinson didn't say Emerald Warlock or Aoi Master were using Witchcraft, did he? 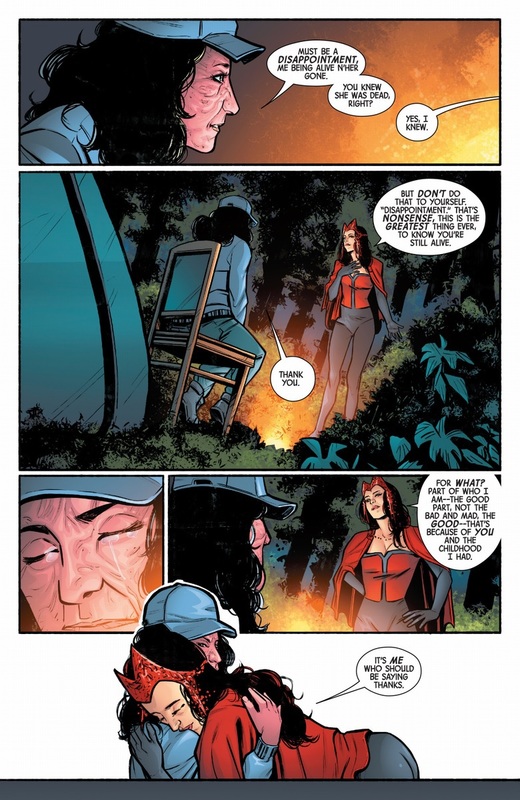 I remember Emerald Warlock did have some problems in an area of "women's magic," after luring Wanda into a place of "man's magic" that had weakened her. 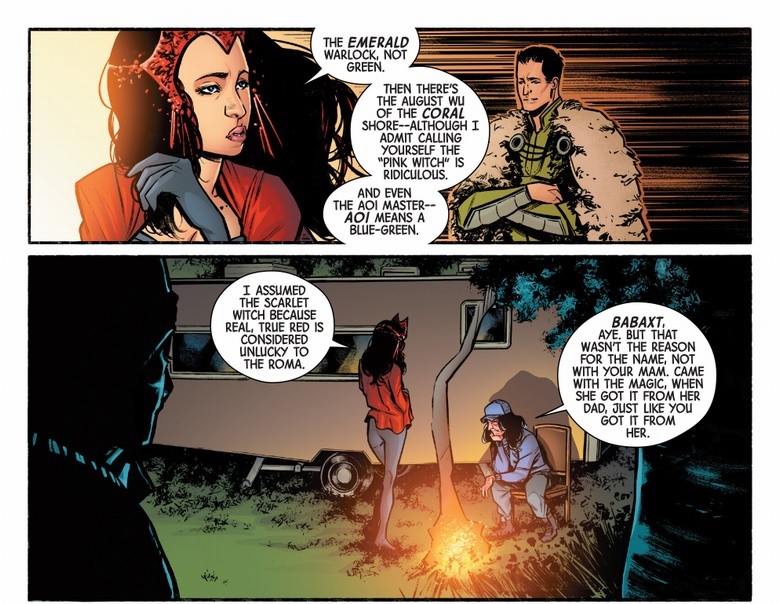 I assume she just means Natalya inherited magic power, not specifically the 'chaos magic'/witchcraft flavor, from her dad. A fair assumption, certainly, especially since her brother Django would also have inherited his magic from their father. But it still strikes me as odd. I think the magic Django was using was actually supposed to be inherent in the wood he carved his puppets from—originating in trees that had been growing on Mount Wundagore while Chthon was imprisoned within it. The (non-mystic) Avengers were able to use one of his dolls against Chthon after he died. I wonder if the Witches Road is anything akin to the Winding Way, the form of magic used by the MU's OTHER, and always actually sorcerous, Roma magic users, Margali Szardos and her daughter Amanda Sefton (Nightcrawlers adoptive mother and adoptive sister/girlfriend), who would be logical people to include in such a story. They never did reveal where that wand Margali got most of her power from originated, did they? 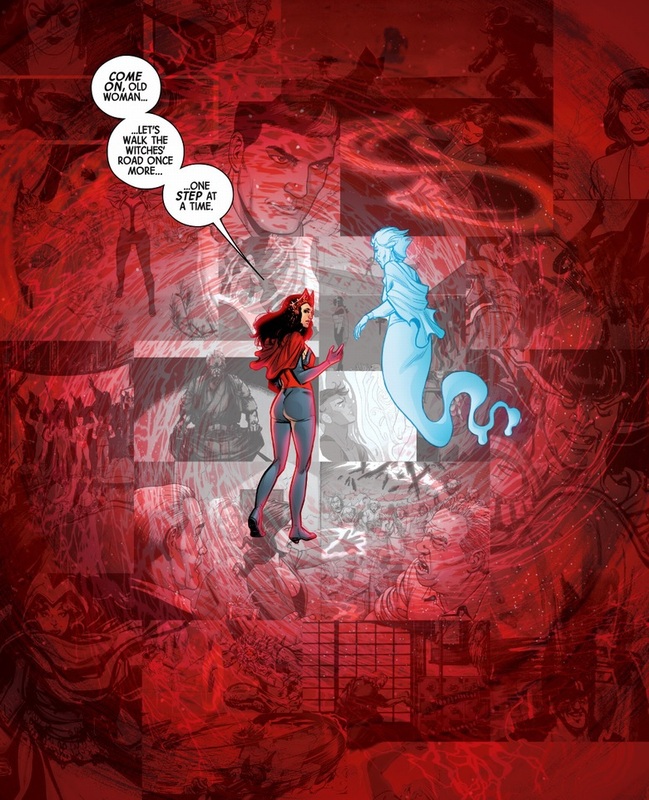 With that thing in hand she was able to create a whole facsimile Hell to torment Nightcrawler, and she fought Dr. Strange to a draw on one occasion and nearly killed him before losing on another. Yeah, that was one example, she also allied with the London Hellfire Club to use Douglock to summon a demon that lived under London, and was a bearer of the soulsword for a while after conning Amanda into giving it to her and used it to kill those ahead of her on the Winding Way, when she's on the right part of her Way, she has a LOT of magic at her disposal, and she's morally ambiguous about it's use, to say the very least. 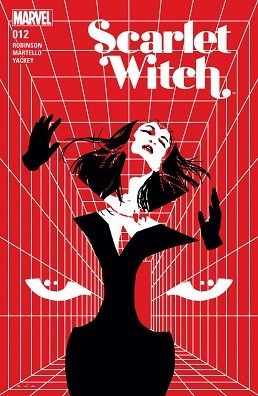 Okay, was "Witches identify themselves with a color, but never a basic one" really a naming convention that needed to be lampshaded and given an explanation? It just strikes me as over explaining.